Record hot years in England are expected to increase further over coming years because of man-made climate change, scientists say. 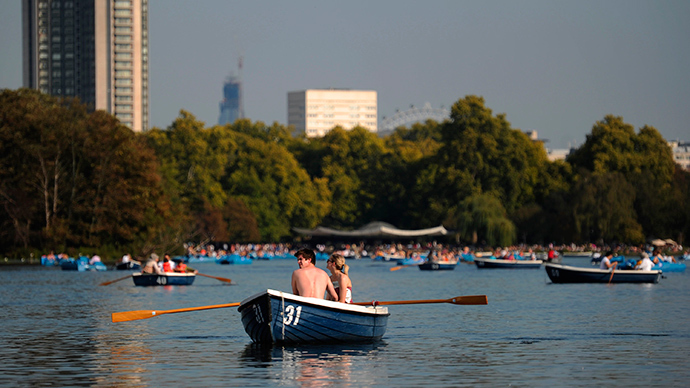 In 2014, England experienced its hottest year since records began in 1659. However, even hotter summers may be in store owing to man-made climate change. By studying temperate changes in England, scientists sought to determine whether human-induced climate change altered the likelihood of very warm years. “We found that human-induced climate change has increased the likelihood of very warm years in central England by at least 13-fold,” Dr King said. Dr Geert Jan van Oldenborgh from the Royal Netherlands Meteorological Institute, who co-authored the study, told the Guardian: “Climate change has become so strong over the last 10 to 15 years that you can really sense it now on the local level. Van Oldenborgh added the findings could be used to research how climate influences events like the 2013 UK floods. The international team of scientists, using computer modeling and analysis of historical records, showed that man-made (or anthropogenic) climate change is likely to have an impact on increasing temperatures. Bob Ward, policy and communications director at the Grantham Research Institute on Climate Change at the London School of Economics, said the findings showed how changing temperatures in the UK are affecting people’s lives. “As the atmosphere warms, it can hold more water, leading to heavier rainfall. Many people, particularly farmers and gardeners, are already observing these impacts, for instance, through spring arriving earlier, and a gradual shifts in the location of some plant and animal species. “But climate change is also increasing the risk of flooding, both inland from rainfall and along our coasts due to sea level rise, and the risk of heat waves,” he told the Guardian.